Frederick I (c. 912 – 18 May 978) was the count of Bar and duke of Upper Lorraine. He was a son of Wigeric, count of Bidgau, also count palatine of Lorraine, and Cunigunda,  and thus a sixth generation descendant of Charlemagne. Wigeric or Wideric was the count of the Bidgau and held the rights of a count within the city of Trier. He received also the advocacy of the Abbey of Saint Rumbold at Mechelen from Charles III of France. From 915 or 916, he was the count palatine of Lotharingia. He was the founder of the House of Ardennes. Count palatine is a high noble title, used to render several comital styles, in some cases also shortened to Palatine, which can have other meanings as well. Cunigunda was the daughter of Ermentrude of France, daughter in turn of Louis the Stammerer, king of the Franks. The identity of her father is unknown. In 898 her uncle Charles III gained control as king of the Franks, changing Cunigunda's life for the better. In 954, he married Beatrice, daughter of Hugh the Great, count of Paris, and Hedwige of Saxony. He received in dowry the revenues of the abbey of Saint-Denis in Lorraine. To stop incursions from the duchy of Champagne, Frederick constructed a castle over the Ornain river in 960, and later occupied confiscated lands of Saint-Mihiel. He exchanged fiefs with the bishop of Toul. Thus, he created his own feudal domain, the county of Bar. So he became the founder of the House of Bar or the House of Ardennes-Bar, a cadet branch of the House of Ardennes. Beatrice of France or Beatrice of Paris was duchess consort of Upper Lorraine by marriage to Frederick I, Duke of Upper Lorraine, and regent of Upper Lorraine in 978-980 during the minority of her son Thierry I.
Moyenmoutier is a commune in the Vosges department in Grand Est in northeastern France. Adalbero II of Metz was a Roman Catholic bishop of the 10th and 11th centuries. From 984 he was bishop of Verdun and from 984 until his death bishop of Metz. He was the son of Frederick I, Duke of Upper Lorraine and Beatrice of France, daughter of Hugh the Great. Radbot, Count of Habsburg, also known as Radbot of Klettgau, was Graf (Count) of the county of Klettgau on the High Rhine in Swabia. Radbot was one of the progenitors of the Habsburg dynasty, and he chose to name his fortress Habsburg. ↑ Nash 2017, p. xxvi. ↑ Wickham 2009, p. 450. ↑ Evergates 1995, p. 96. ↑ Reuter 1992, p. 49. ↑ Leyser 1994, p. 166. Evergates, Theodore (1995). "Bar-le-Duc". In Kibler, William W.; Zinn, Grover A. Medieval France: An Encyclopedia. Garland Publishing, Inc.
Leyser, Karl (1994). Reuter, Timothy, ed. Communications and Power in Medieval Europe. The Hambledon Press. Nash, Penelope (2017). Empress Adelheid and Countess Matilda: Medieval Female Rulership and the Foundations of European Society. Palgrave Macmillan. Reuter, Timothy, ed. (1992). Warriors and Churchmen in the High Middle Ages: Essays Presented to Karl Leyser. The Hambledon Press. Gerard, also known as Gerard the Great, was a Lotharingian nobleman. He was the count of Metz and Châtenois from 1047 to 1048, when his brother Duke Adalbert resigned them to him upon his becoming the Duke of Upper Lorraine. On Adalbert's death the next year, Gérard became duke, a position that he held until his death. In contemporary documents, he is called Gérard of Alsace, Gérard of Chatenoy, or Gérard of Flanders. Theodoric II, called the Valiant, was the duke of Lorraine from 1070 to his death. He was the son and successor of Gerhard and Hedwige of Namur. He is sometimes numbered Theodoric I if the dukes of the House of Ardennes, who ruled in Upper Lorraine from 959 to 1033, are ignored in favour of the dukes of Lower Lorraine as predecessors of the later dukes of Lorraine. Sophie of Bar was sovereign Count of Bar and lady of Mousson between 1033 and 1093. She succeeded her brother, Frederick III, Duke of Upper Lorraine, ruled in co-regency with her spouse Louis, Count of Montbéliard, and was succeeded by her son Frederick of Montbéliard. Gothelo, called the Great, was the duke of Lower Lorraine from 1023 and of Upper Lorraine from 1033. He was also the margrave of Antwerp from 1005 and count of Verdun. Gothelo was the youngest son of Godfrey I, Count of Verdun, and Matilda Billung, daughter of Herman, Duke of Saxony. On his father's death, he received the march of Antwerp and became a vassal of his brother, Godfrey II, who became duke of Lower Lorraine in 1012. He succeeded his brother in 1023 with the support of the Emperor Henry II, but was opposed until Conrad II forced the rebels to submit in 1025. When the House of Bar, which ruled in Upper Lorraine, became extinct in 1033, with the death of his cousin Frederick III, Conrad made him duke of both duchies, so that he could assist in the defence of the territory against Odo II, count of Blois, Meaux, Chartres, and Troyes. Godfrey I, called the Prisoner or the Captive, sometimes the Old, was the count of Bidgau and Methingau from 959 and the count of Verdun from 963 to his death. In 969, he obtained the Margraviate of Antwerp and Ename. Between 974 and 998, he was also the count of Hainault and Mons.He was the son of Gozlin, Count of Bidgau and Methingau, and Oda of Metz. He was the brother of Adalberon, Archbishop of Reims, who crowned Hugh Capet the king of France. Godfrey I was the count of Hainault from 958 and margrave or vice-duke of Lower Lorraine from 959, when that duchy was divided by Duke Bruno, who remained duke until his death in 965. The County of Verdun was a medieval county in the Duchy of Lower Lorraine. The Reginarids or House of Reginar were a family of magnates in Lower Lotharingia during the Carolingian and Ottonian period. Their modern name is derived from the personal name which many members of the family bore, and which is seen as a Leitname of the family. At least two Dukes of Lotharingia in the 10th century belonged to this family. 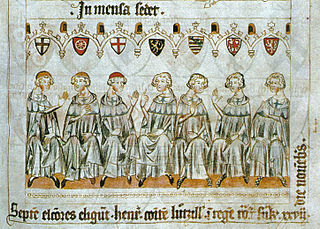 After a period of exile and rebellion, the two brothers who returned to power founded the first dynasties of the County of Hainault and County of Louvain. The latter were ancestors of the House of Brabant, Landgraves and later Dukes of Brabant, Lothier and Limburg. 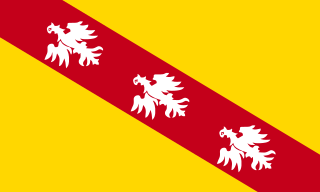 The Reginarid Brabant dynasty ended in 1355, leaving its duchies to the House of Luxembourg which in turn left them to the House of Valois-Burgundy in 1383. Junior branches of the male line include the medieval male line of the English House of Percy, Earls of Northumberland, and the German House of Hesse which ruled Hesse from 1264 until 1918 and still exists today.